Here is a simple way of identifying multiple cables (with the aid of a multimeter). 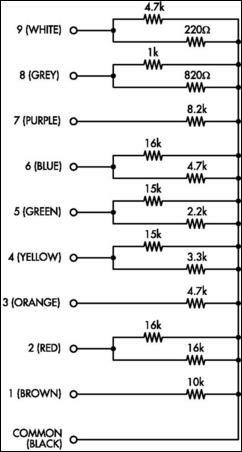 The circuit consists of a series of resistors, selected so that they give readings that coincide with the 1-9 numerals on the 10V scale on a multimeter switched to the Ohms x 100 range. In use, a common wire needs to be chosen and this is usually the shield wire. The resistors go to one end of the cables to be identified, while the multimeter is used at the other end to check the values and identify each lead. Up to nine cables can be identified at a time. If a mistake is made in choosing the common lead, the readings will all be wide of the 1-9 numerals on the 10V scale, thus making the mis­take obvious.